The study explored the impact of National Health Service changes on the working and personal lives of psychiatrists. A questionnaire survey was carried out with psychiatrists working in the South Eastern Division of the Royal College of Psychiatrists. The response rate was 44.9%. Changes to services have reduced stress in some areas, but increased stress in others. Over the past decade early retirement has become less popular, but psychiatrists have been more likely to self-prescribe and have suicidal thoughts. The increasing involvement of psychiatrists in leadership may be a way to reduce adverse impacts of future changes on their working lives. This chapter aims to offer the reader an understanding of how to prevent relapse by developing a relapse prevention plan based on their own likely stressors and individual relapse symptoms. 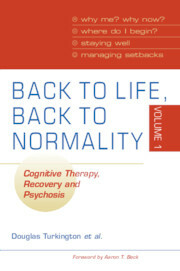 • Written specifically with sufferers and carers in mind, to help them understand and apply the basic concepts of cognitive therapy for psychosis.• Illustrates what it is like to have common psychosis and how people's lives can be restored using therapy.• Increases understanding of how the psychosis started, and the factors that worsen symptoms or increase the likelihood of relapse.• Helps the sufferer learn how to control symptoms and delay or prevent relapse.• Includes features and exercises to help sufferers explore their own beliefs and feelings to reflect on the way they cope.• Helps carers know what to say and what to do.• Provides a resource for mental health professionals working with patients, to introduce the approach, support ongoing therapy and make the most efficient use of appointment time.